Every Hull is quality controlled using ultra-sound inspection and certification. 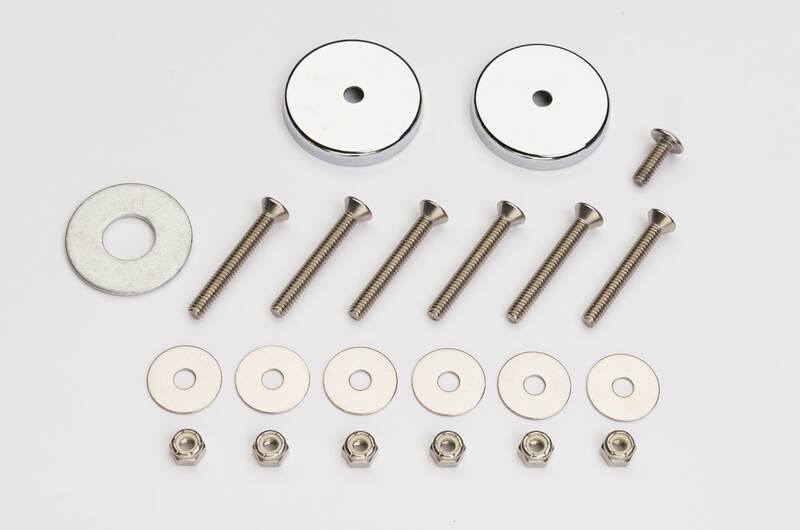 All components attached with mold in threaded inserts and SS hardware (no rivets). 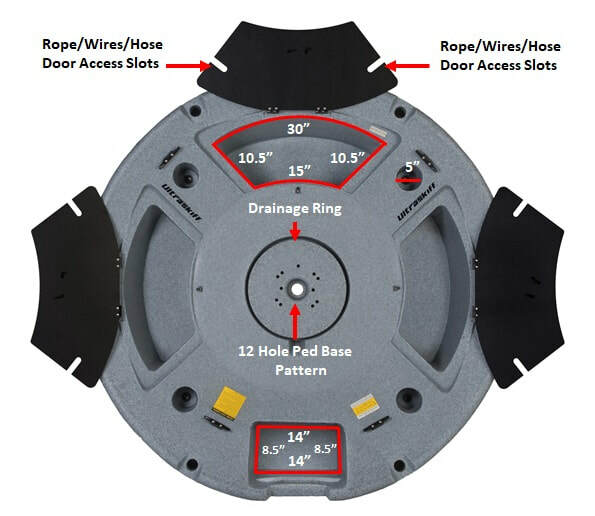 Each Hull includes 2 circle magnets, 1 magnet spacer, and a complete set of SS hardware for mounting a pedestal base along with instruction book, and an M.S.O. (Manufacturers Statement of Origin). Detachable Pedestal Mount Weight: 5 Lbs. 3 Deep, Wide, Elevated Storage Compartments (the doors make great cutting boards when opened) Each door as 2 access slots that are used for feeding wires, anchor/dock lines and hoses into the compartments while the doors are closed. These access slots also help you feed cables and wires around the boat by feeding them through the slots so they keep the wires away from the deck. Every doors has a bungee latch that you can tighten and adjust anytime. 4 Large Cup Holder/Utility Pockets biggest enough to fit any phone. 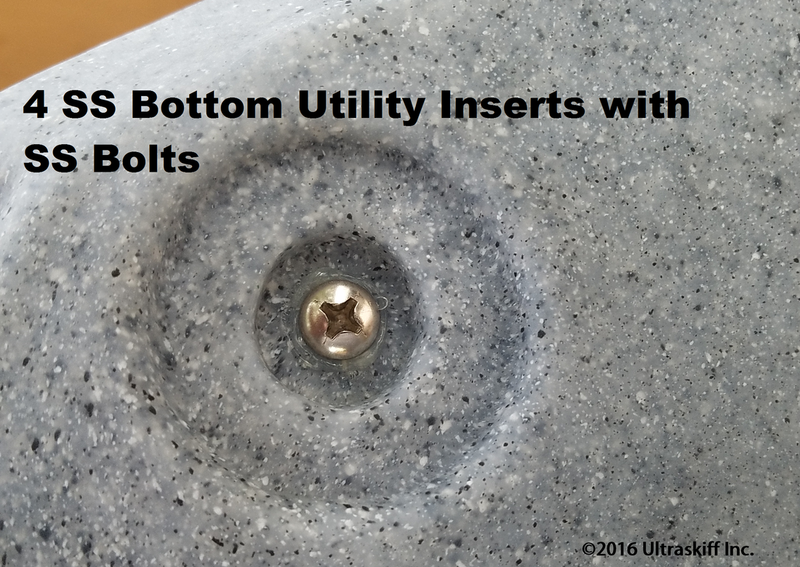 4 - 5” Cleats with threaded inserts underneath, allowing you to take them out and replace them with external rod holders or fish finders. 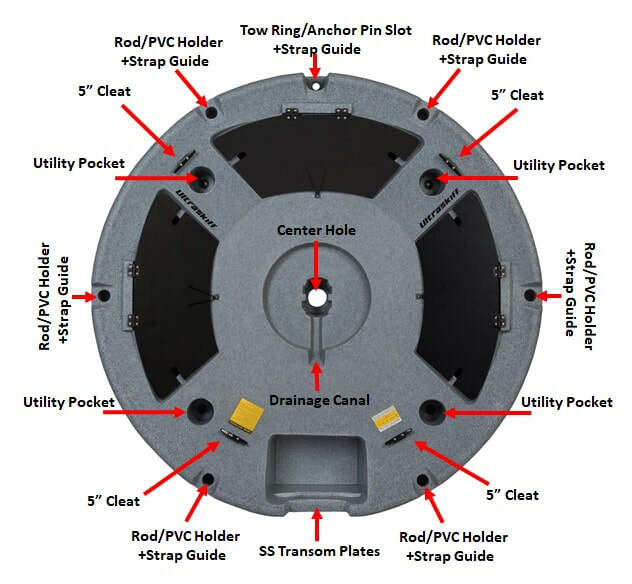 4 - Bottom utility inserts hidden in recessed disks at all 4 corners of the hull bottom, allowing you to mount magnets, brackets and plates for transducers and pumps. 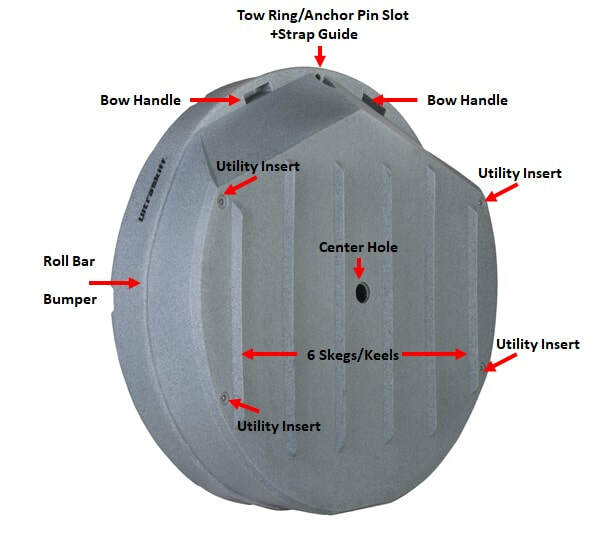 1 Molded Tow Ring that can be also used as an anchor push pin holder. 2 Deep mold-in handles underneath the flare for lifting, carrying and dollying the boat by hand. 8 strap guides, strategically positioned around the perimeter of the craft to enable different methods of securing the boat to roof racks and trailers. ​The deepest of the strap guides are on the front and rear of the hull, which is the ideal place for securing the boat a trailer with 2 ratchet straps. There is no need for any “specialized trailers” or “specialized dollies”. The exposed center hole and deep grooved strap guides lets you secure 2 of them to any small trailer, cargo carrier or pickup truck bed with ratchet straps. They can also be strapped to any vertical cargo carrier behind an RV. 6 Rod Holders, All equally spaced and perfect for creating custom duck blinds, tents, sun shades and anything else out of 1 1/4" PVC. 6 Skegs for tracking and Hull protection. 1 Bumper/Roll bar. 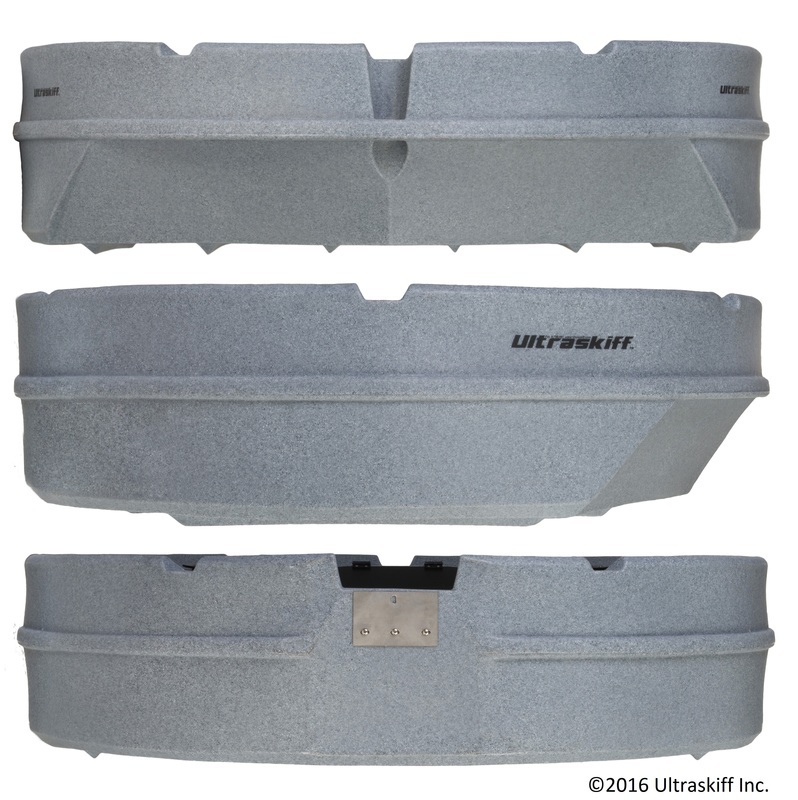 It protects the side when rolling, sliding or impacting a dock or piling. 1 Strategically positioned flare on the bow that prevents water from splashing up while giving the boat the lift it needs to get through and over large swells. 1 Drainage canal that lets water drain around the ring of the pedestal mount and through the main tunnel access in the rear. You can feed hoses and wires through the main tunnel and into the pedestal mount or underneath the pedestal mount through the shock absorber hose. 2 Transom Plates that are stainless steel and removable. 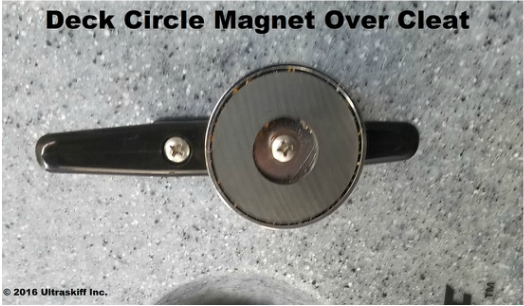 2 Circle Magnets, one for deck installation and the other for Hull Installation. 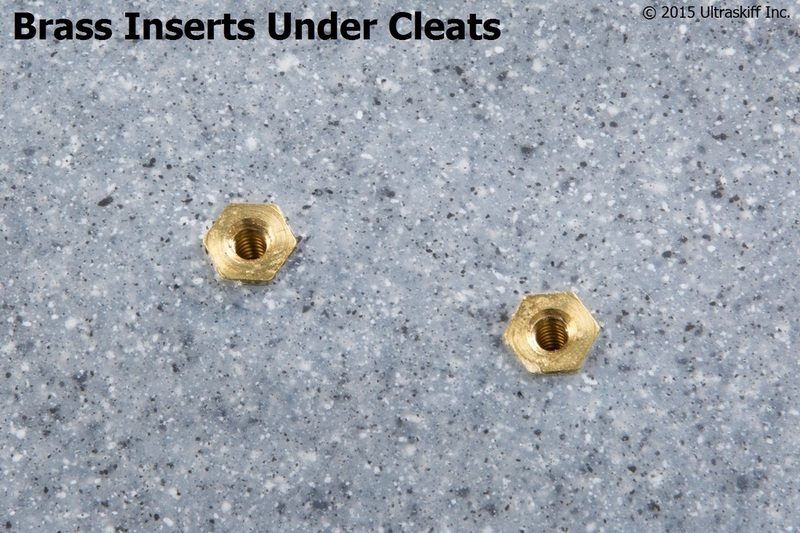 This is a molded detachable pedestal mount, it has a large hole its center and 18 -1/4" holes. The hole pattern pattern fits commercially sold removable 7" Square and 9" Round pedestal bases that have one of the two hole patterns seen below (ex. Springfield, Swivl-Eze). 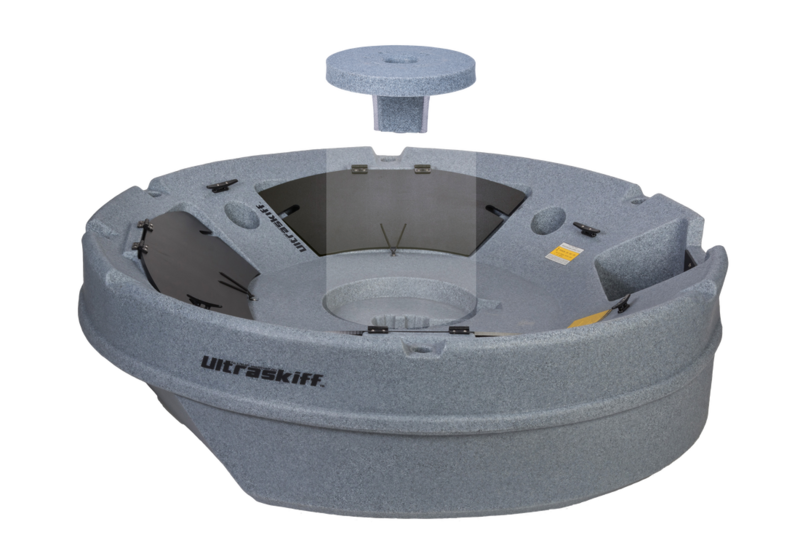 The Stainless Steel hardware listed below that is needed to attach a pedestal base is included with each purchase of an Ultraskiff 360.